From tardus (slow) and gradi (walk). In English, tardigrades are also called water bears. This is a group of small animals, from 50 micrometres to 1.2 mm, with four pairs of short legs. There are 600 known species, found on land (in the soil) or aquatic (fresh water and sea water) and in all climates. Several characteristics, including the presence of a cuticle, make them similar to arthropods. Under their current classification, they are panarthropods, alongside Onychophora (Peripatus, worms lined with cuticula that have limbs) and euarthropods (arthropods in their true form, notably insects and crustaceans). - exposure to X-rays of 570,000 rads (500 rads is the lethal dose for humans). 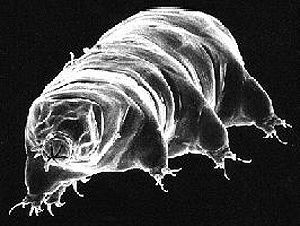 According to Russian zoologists, tardigrades were able to survive an excursion into space.